𝑻𝒐 𝒑𝒆𝒓𝒔𝒐𝒏𝒂𝒍𝒊𝒛𝒆, 𝒑𝒍𝒆𝒂𝒔𝒆 𝒍𝒆𝒂𝒗𝒆 𝒚𝒐𝒖𝒓 𝒅𝒆𝒕𝒂𝒊𝒍𝒔 𝒊𝒏 𝒕𝒉𝒆 "𝒑𝒆𝒓𝒔𝒐𝒏𝒂𝒍𝒊𝒛𝒂𝒕𝒊𝒐𝒏 𝒃𝒐𝒙" 𝒐𝒏 𝒕𝒉𝒊𝒔 𝒍𝒊𝒔𝒕𝒊𝒏𝒈 𝒐𝒓 𝒕𝒉𝒆 "𝒏𝒐𝒕𝒆 𝒕𝒐 𝒔𝒆𝒍𝒍𝒆𝒓" 𝒅𝒖𝒓𝒊𝒏𝒈 𝒄𝒉𝒆𝒄𝒌𝒐𝒖𝒕. 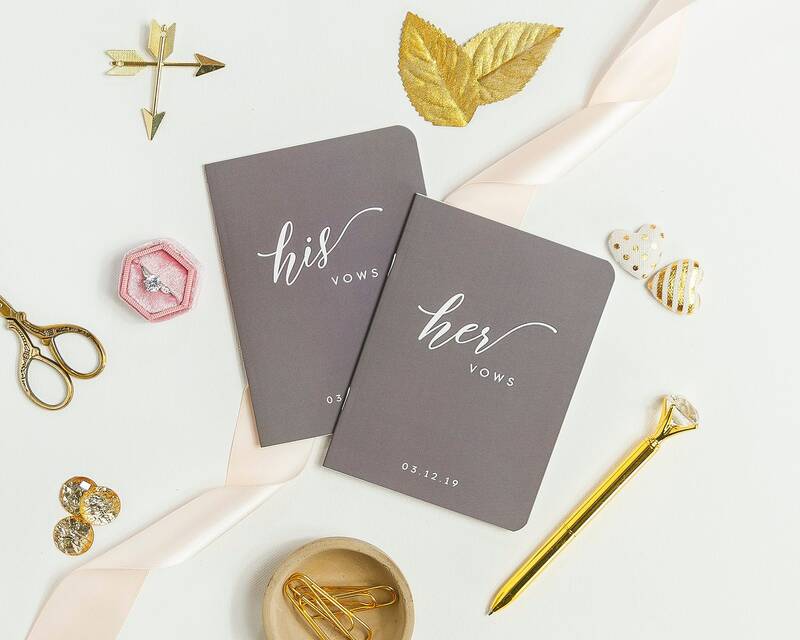 Write your very own vows to your partner in crime with these instant wedding keepsake vow books. Each booklet comes with enough lined pages to write your heart's true love to your significant other in your own hand. 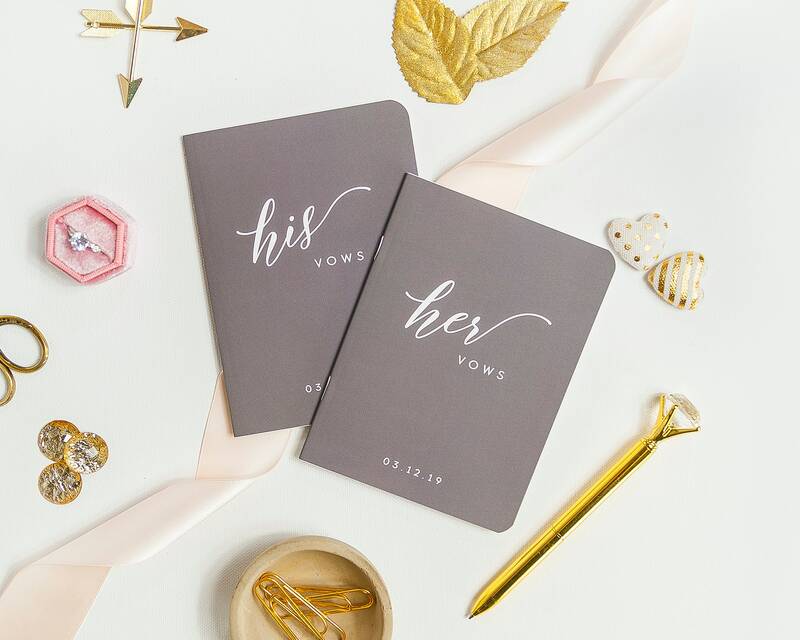 Personalized just for your big day, our vow booklets can be foiled or printed with regular ink. 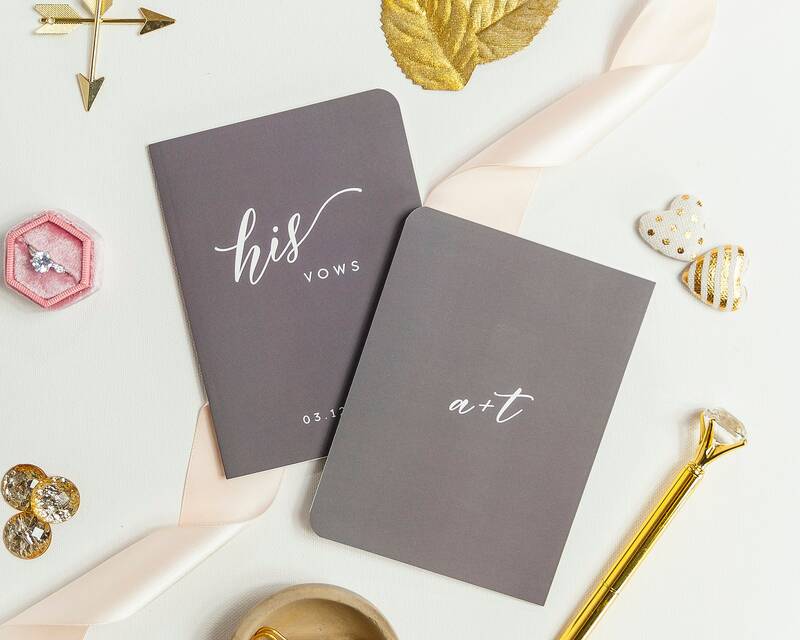 Choose your options to customize your vow book set just for you & yours. ◈ May choose 1 color for both, or 2 different colors for your set of his/hers! 𝑭𝒐𝒓 𝒓𝒆𝒇𝒆𝒓𝒆𝒏𝒄𝒆: 𝗧𝗵𝗶𝘀 𝘀𝗲𝘁 𝗳𝗲𝗮𝘁𝘂𝗿𝗲𝘀 𝗼𝘂𝗿 𝗱𝗮𝗿𝗸 𝗴𝗿𝗮𝘆 𝗰𝗼𝘃𝗲𝗿 (𝟰𝟮) 𝘄𝗶𝘁𝗵 𝘄𝗵𝗶𝘁𝗲 𝘁𝗲𝘅𝘁 (𝟬𝟭). ◈ A proof is NOT provided, so please enter your details exactly as you want them printed, including upper/lower case. Check your spelling carefully! ◈ 𝑪𝒉𝒆𝒄𝒌 𝒚𝒐𝒖𝒓 𝒔𝒉𝒊𝒑𝒑𝒊𝒏𝒈 𝒂𝒅𝒅𝒓𝒆𝒔𝒔. 𝐖𝐞 𝐜𝐚𝐧𝐧𝐨𝐭 𝐜𝐡𝐚𝐧𝐠𝐞 𝐲𝐨𝐮𝐫 𝐚𝐝𝐝𝐫𝐞𝐬𝐬 𝐚𝐟𝐭𝐞𝐫 𝐲𝐨𝐮 𝐩𝐥𝐚𝐜𝐞 𝐲𝐨𝐮𝐫 𝐨𝐫𝐝𝐞𝐫, 𝐞𝐯𝐞𝐧 𝐢𝐟 𝐢𝐭 𝐡𝐚𝐬 𝐧𝐨𝐭 𝐲𝐞𝐭 𝐬𝐡𝐢𝐩𝐩𝐞𝐝 𝐨𝐮𝐭. 𝐏𝐥𝐞𝐚𝐬𝐞 𝐝𝐨𝐮𝐛𝐥𝐞- 𝐚𝐧𝐝 𝐭𝐫𝐢𝐩𝐥𝐞-𝐜𝐡𝐞𝐜𝐤 𝐲𝐨𝐮𝐫 𝐚𝐝𝐝𝐫𝐞𝐬𝐬 *𝐛𝐞𝐟𝐨𝐫𝐞* 𝐜𝐨𝐦𝐩𝐥𝐞𝐭𝐢𝐧𝐠 𝐲𝐨𝐮𝐫 𝐩𝐮𝐫𝐜𝐡𝐚𝐬𝐞. 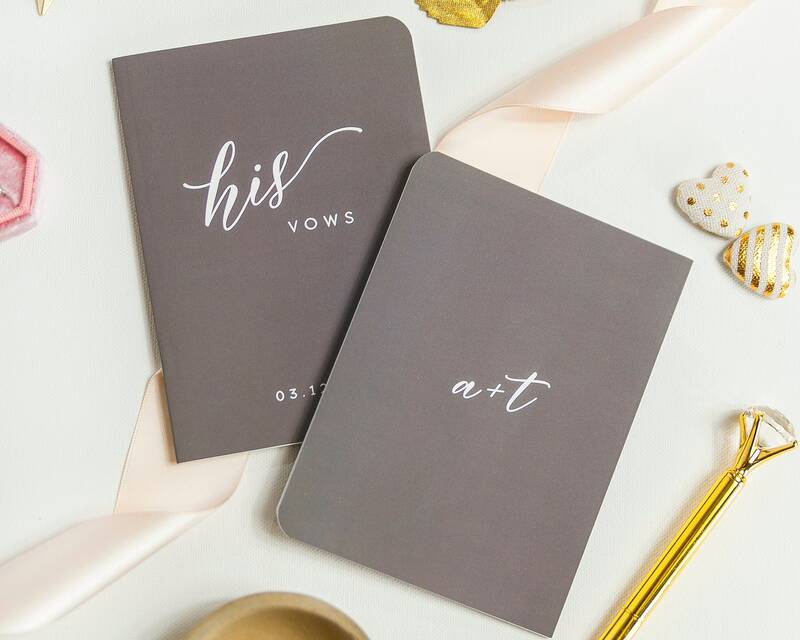 ◈ Printing & Production of your custom vow books takes approximately 5-7 business days after you place your order. Business days are M-F and don't include weekends/holidays. ◈ Shipping is via USPS First Class Mail with an average transit time of 2-3 days. Priority or Express upgraded shipping is available at checkout. ◈ It's recommended to allow 2-3 weeks, generally, from order to receipt. If you need your vow books sooner, please contact us for rush options and/or upgrade your shipping. Etsy will display a delivery "estimate" window for you during checkout. Please note, we run the full length of our quoted production & shipping timeframes 95% of the time. Please allow for the maximum of both and remember that both are estimates, and some variation may occur. When in doubt, please reach out to us *before* ordering to discuss your specific timeline so we can best assist you. Please treat your vow books with special care, especially if you select foil printing. The foil is real metal, and subject to scratching or damage if it's pushed against or rubbed against another object. Treat these as the keepsakes they're meant to be, and you'll have great results. 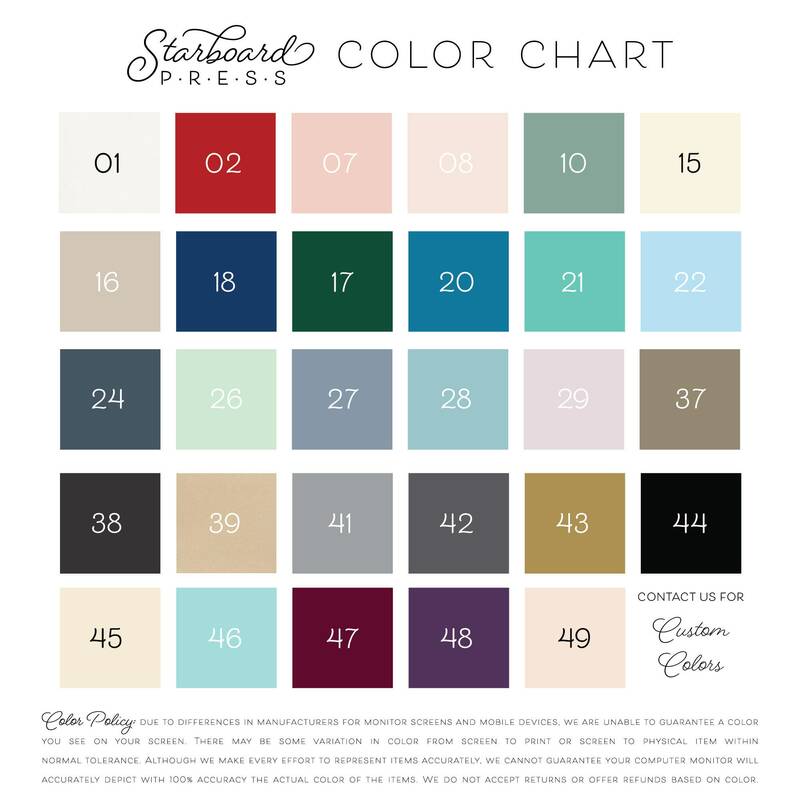 More general information can be found in our Care Guide for Starboard Press products. © 𝟐𝟎𝟏𝟐-𝟐𝟎𝟏𝟗 𝐒𝐭𝐚𝐫𝐛𝐨𝐚𝐫𝐝 𝐏𝐫𝐞𝐬𝐬, 𝐋𝐋𝐂. All content and designs in our store are our exclusive intellectual property. We have and will continue to vigorously defend our designs and products against copyright infringement. 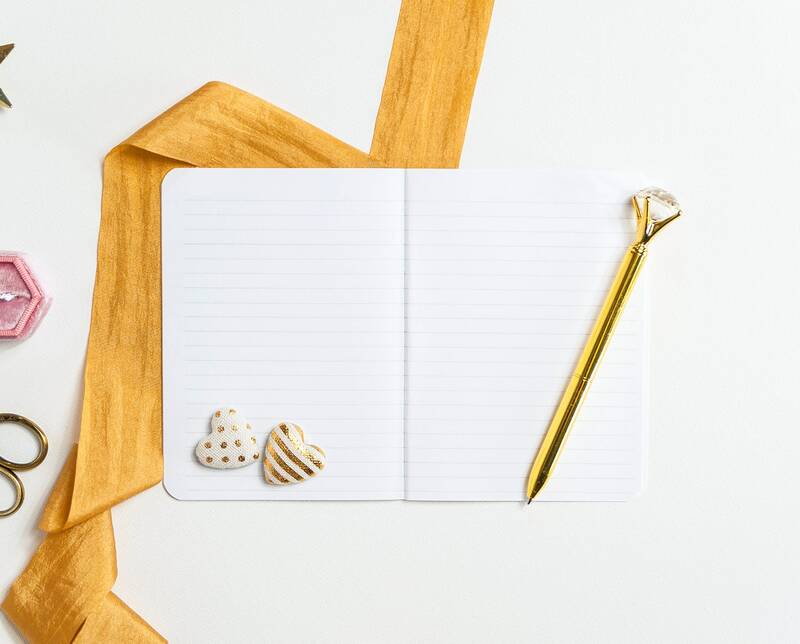 Duplication of our intellectual property, designs, products or written content in our listings or on our website will lead to immediate reporting to Etsy and legal action. To fulfill your order, you must provide us with certain information (which you authorized Etsy to provide to us), such as your name, email address, postal address, payment information, and the details of the product that you’re ordering. You may also choose to provide us with additional personal information (for a custom order, for example), if you contact us directly. We may store and process your information through third-party hosting services in the US and other jurisdictions. As a result, we may transfer your personal information to a jurisdiction with different data protection and government surveillance laws than your jurisdiction. If we are deemed to transfer information about you outside of the EU, we rely on Privacy Shield as the legal basis for the transfer, as Dropbox is Privacy Shield certified. •	Object. You can object to (i) our processing of some of your information based on our legitimate interests and (ii) receiving marketing messages from us after providing your express consent to receive them. In such cases,weI will delete your personal information unless we have compelling and legitimate grounds to continue using that information or if it is needed for legal reasons. For purposes of EU data protection law, we, Starboard Press LLC, are the data controller of your personal information. If you have any questions or concerns, you may contact us at info@starboardpress.net. 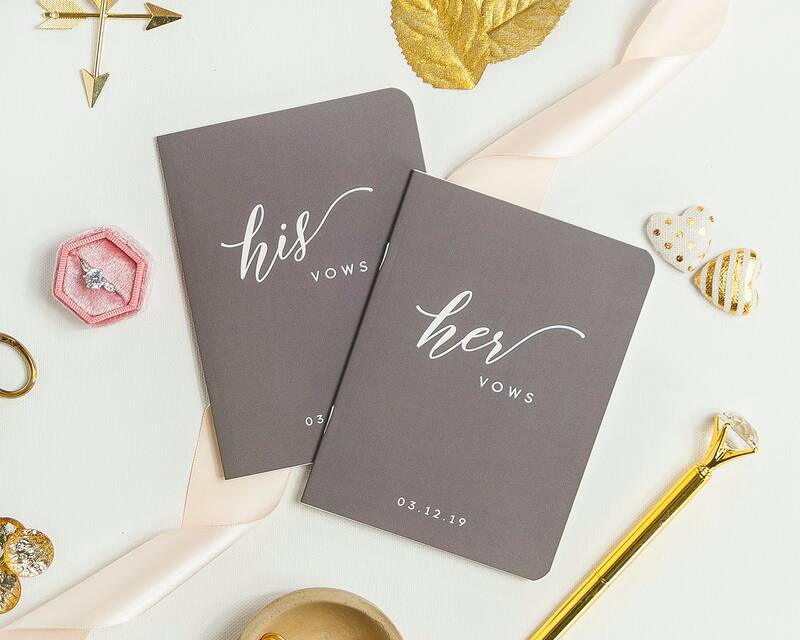 Will I see a proof of my guest book, invitation, save the date, or other personalized item? Proofs are sent to your email on file in 1-2 business days. We require your proof to be approved on time to keep your order moving toward production and shipment. Please use a valid email address that you check regularly for ordering and be prepared to approve. We'll send daily reminders for 7 business days before sending to print as is, as we cannot hold orders indefinitely. One initial proof and 2 rounds of minor revisions are included in your purchase price. Additional proofs incur additional charges. I want to customize something on this design. Do I need to contact you first? Yes. The listed price reflects the design shown. For customizations to designs shown that are more than just changing names, dates, etc., please email us ahead of time to be sure we can accommodate your request, especially if your request includes adding more text than what is shown on the sample, like adding/removing/changing graphics. We'll advise you at that time if we can accommodate your request and if extra design fees will apply. 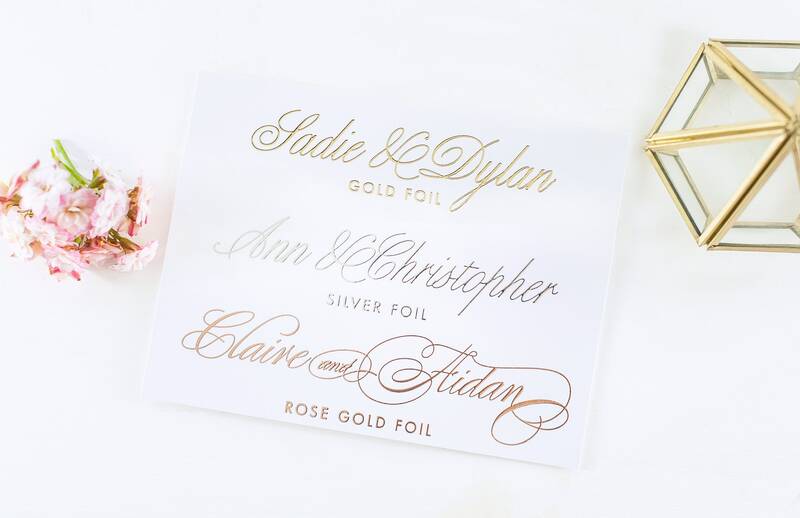 FONT CHANGES - GUEST BOOKS & STAMPS: These are sold with the fonts shown. Font changes to things like guest books, stamps etc. 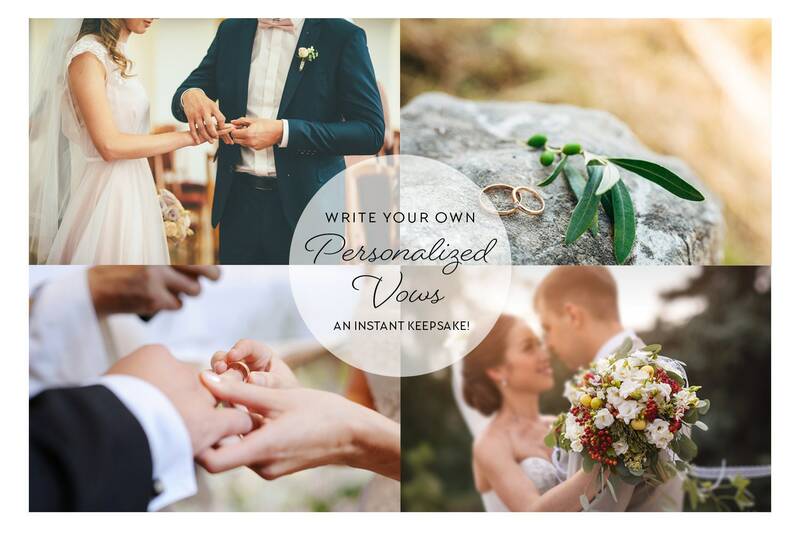 require additional typesetting and design time above and beyond standard personalization. A font change add-on fee ($5) is required to process a font change on these orders. I live outside of the US. Do you accommodate international orders? Yes! We love our international customers and ship worldwide. Please be sure to check both the processing and transit times on your chosen item to be fully aware of how long your item may take to ship if it's non-personalized, to make first once approved and then ship if it's personalized, and then also how long your chosen transit time will take. 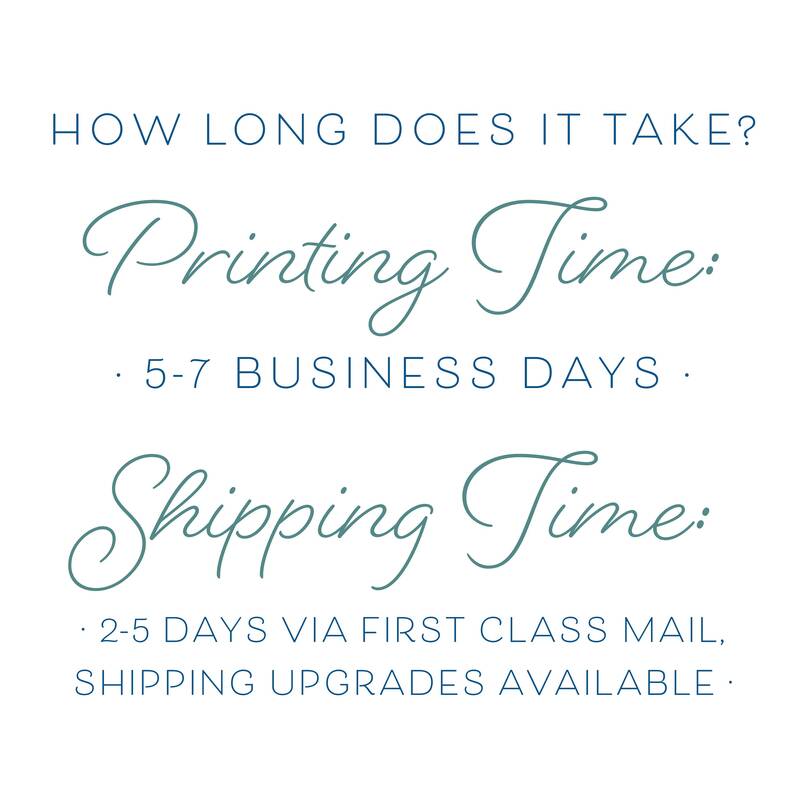 Especially if you are ordering for your wedding, you'll want to make sure your item will arrive on time. We offer a few different types of international shipping; full information is in our shop policies under our shipping policy for all options. Note that international customers are responsible for any customs/duty tax or related fees for importing items. I've ordered a personalized item. How long will it take to ship? All of our listings include details on the processing times (the amount of time it takes to make your item once it's approved) for those items. You'll also get an estimate of the ship date displayed when checking out through the Etsy system, and this assigned date will also be on your order receipt. Orders that need to be approved before making will move fastest if you are able to approve your proof on time; client response time does factor in to how long it takes to receive your item. If proof approval is delayed, we may not be able to ship by the date assigned. We do offer expedited shipping options on the checkout screen. These expedited transit times take effect *after* your item has been made to order and shipped. Do you take cancellations or returns on personalized, custom, or made to order items? The window for cancellation is one hour post purchase. Once your proof is made and delivered, the order is no longer eligible for cancellation as work has then begun on your custom order. Once your proof is approved and put in to production we are not able to cancel it. Personalized and/or custom items are not eligible for return/refund. We are not able to take returns due to misspellings or grammatical errors in your approved proof regardless of where they originate. Your signed proof approval indicates that you have reviewed and are accepting the wording and layout shown to be used for the final print. In the rare event that a personalized or custom order arrives damaged, we will replace it, but we MUST receive photos of damage first. • RUSH: f yours is a rush order we always appreciate a heads up first to be sure we can accommodate your request. We will advise you of our typical turnaround times on the item you wish to purchase and what type of shipping will be necessary for it to reach you by your desired date. Please note, there may be times we can NOT accommodate a rush order due to our workload. • CUSTOM: Occasionally we can take on custom design for personalized items. Please contact us ahead of time to be sure we can accommodate your request and discuss your options so we can set up a custom order just for you. During the height of wedding season, we may be overbooked or unable to take custom orders due to time constraints. Please double and triple-check your shipping address *prior* to checking out to be sure it is accurate and correct and where you wish your order to be sent. For custom orders especially, we cannot change your address once it has gone to production. This is the case even if the order has not yet shipped out. We encourage you to review your address during the checkout process and update it at that stage before your payment is complete. You can update your address under You-->Account or do it during the checkout process as well. We are not responsible for an order shipping to an outdated address because it was not updated during purchase. If an order is returned to us due to an outdated address, the buyer will be responsible for new postage. The designs in our store and our written content are copyrighted by Starboard Press. Duplicating our designs or written content constitutes copyright infringement and is prohibited. All designs are for personal use only and reproduction or resale is strictly prohibited. Due to differences in manufacturers for monitor screens and mobile devices, we are unable to guarantee a color you see on your screen. There may be some variation in color from screen to print or screen to physical item within normal tolerance. Although we make every effort to represent items accurately, we cannot guarantee your computer monitor will accurately depict with 100% accuracy the actual color of the items. We do not accept returns or offer refunds based on color. I'm in the EU, Australia, or another country that assess VAT/GST/import tax. Is it included in your pricing? No. As a US-based business, we are not legally allowed or registered to collect and remit VAT, GST, or other import taxes for other countries. Etsy currently has some wording relating to this underneath the listing price that may display based on your location if you're an international customer. Please note that VAT or GST, etc. is **NOT included** in the price listed, and is not collected or remitted by us. Buyers are responsible for any and all import taxes that may be due on the items they purchase from us and thus import from the US. This includes VAT or GST which are taxes assessed by your local government at the time of delivery. Shipping transit time occurs *after* production time. There is a pull-down menu during checkout to choose your transit time from standard to expedited options. Please choose a shipping transit option that takes into account the time it takes the item to be made before shipping, and then the shipping days to get to you. Please note that production and transit times are **estimates only. ** Our process is custom and some variation may occur.